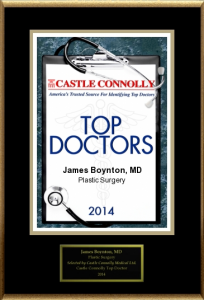 We are excited to announce that Dr. James F. Boynton has recently been selected by Castle Connolly Medical Ltd. as one of the 2014 “Top Doctors” for plastic surgery in our region! To compose the annual list, Castle Connolly surveys thousands of physicians as well as other professionals in the healthcare industry to identify those who demonstrate excellence in their particular medical specialty. Based on survey results, peer nominated doctors are screened by the Castle Connolly physician-led research team and evaluated on various credentials including education and training, hospital affiliations, history of disciplinary action, and more. Once the final screening process is complete, physicians who are considered the most elite within their region and specialty are named to the “Top Doctors” list. This accolade marks Dr. Boynton’s fourth straight year as a “Top Doctor” in our region for plastic surgery, an honor for which he is extremely grateful to be recognized. He hopes both current and prospective patients will view this peer selection as a testament to his skill and devotion to cosmetic surgical care, and he will strive to continue going above and beyond to ensure every individual receives an optimal level of treatment from consultation to recovery. For more information about Castle Connolly’s “Top Doctors” selection process, or if you would like to schedule a consultation with Dr. Boynton, please contact us today.